Barbie's vintage backyard BBQ ensemble had a pretty dusty rose sundress in a cotton broadcloth. The dress features a full skirt and the back straps have tiny buttons. The neckline and pockets are accented with crochet trim. The realistic utensils are made of real metal and have red handles. The utensils will frequently have dark spots and other signs of age. As with many vintage ensembles, the tiny accessories are usually harder to find than the clothing. These clothing pieces held up very well and are easy to find. The dress has a back zipper and a cloth Barbie tag. 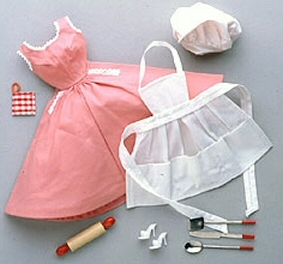 The Barbie Doll Clothes made in 1959 will have a TM after the Barbie name. Those made later will have the ®.